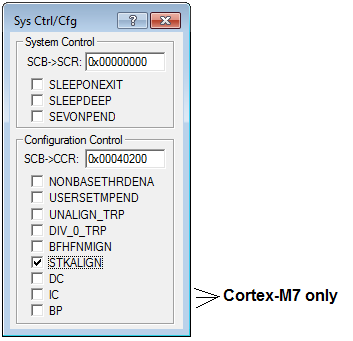 The System Control and Configuration dialog (for Cortex-M3, Cortex-M4, and Cortex-M7) shows controls about low power state and some aspects of the processor behavior. The System Control Register (SCR) controls features of entry to and exit from low power state and is located at memory address 0xE000ED10. SCB->SCR Content of the SCR in Hex. Reset value is 0x00000000. SLEEPONEXIT Determines whether, on exit from an ISR that returns to the base level of execution, the processor enters a sleep state. 1 (checked) = deep sleep. If your device does not support two sleep modes, then the effect of changing the value of this bit is implementation-defined. 0 (unchecked) = only enabled interrupts or events can wakeup the processor, disabled interrupts are excluded. 1 (checked) = enabled events and all interrupts, including disabled interrupts, can wakeup the processor. When an event or interrupt enters pending state, the event signal wakes up the processor from WFE. If the processor is not waiting for an event, then the event is registered and affects the next WFE. The processor also wakes up on execution of an SEV instruction or an external event. Shows the Configuration and Control Register (CCR) settings. The CCR is a read-only register. SCB->CCR Shows the content of the CCR register (in HEX) located at memory address 0xE000ED14. The reset value is 0x00000200, however, it is implementation-defined. 0 (unchecked) - Processor can enter Thread mode only when no exception is active. an LDM or POP instruction that loads the PC. an LDR instruction with PC as the destination. a BX instruction using any register. USERSETMPEND Enable (when checked) unprivileged software access to the Software Trigger Interrupt Register (STIR). Refer also to NVIC, section Software Interrupt Trigger. 0 (unchecked) - Do not trap unaligned halfword and word accesses. 1 (checked) - Trap unaligned halfword and word accesses. An unaligned access generates a UsageFault. Unaligned LDM, STM, LDRD, and STRD instructions. 0 (unchecked) - Do not trap divide by 0; a divide by zero returns a quotient of 0. 1 (checked) - Trap divide by 0. 0 (unchecked) - data bus faults caused by load and store instructions cause a lock-up. 1 (checked) - handlers running at priority -1 and -2 ignore data bus faults caused by load and store instructions. Set this bit to 1 only when the handler and its data are in absolutely safe memory. The normal use of this bit is to probe system devices and bridges to detect control path problems and fix them. 0 (unchecked) - 4-byte aligned. 1 (checked) - 8-byte aligned. On exception entry, the processor uses bit of the stacked PSR to indicate the stack alignment. On return from the exception it uses this stacked bit to restore the correct stack alignment. 0 (unchecked) - L1 data cache disabled. 1 (checked) - L1 data cache enabled. 0 (unchecked) - L1 instruction cache disabled. 1 (checked) - L1 instruction cache enabled. (Cortex-M7 only) It indicates branch prediction is enabled. Always reads-as-one. You can access peripheral registers and related functions from the user application. As a minimum, the files <device>.h and <core_cm#>.h define the register layout, base addresses, and access definitions. Refer to CMSIS-CORE – Peripheral Access for details. Refer to Intrinsic Functions for CPU Instructions for the set of available functions in CMSIS, specifically __WFE and __SEV.